I’ve read the books quite some time ago (I do think I’ll be reading them again) and loved them. Now I watched the first two movies of the series, I can say I’m happy with how much they are sticking to the story and that Jennifer Lawrence deserved the Oscar she received. The movie is a ride from the start to the finish, even the parts where the story is not action-packed, it’s either emotionally or atmospherically strong. Jennifer brought the Katniss from the book to such unbelievable life that I actually understood more of the book character while watching the movie, than I did when I was reading it. The same parts that is. In the end, I understood that Katniss is a force to reckon with just because she is a girl who wants to love her life in peace with her family and will do anything to protect them (I wonder if she would be Scorpio, I don’t remember if the date of her birth is given in the book). Katniss is an incredibly well written character and very different from what we as YA readers are used to. And Jennifer brought it all to life as if she was born to be Katniss. starring these wonderful actors. And they are all truly great in the way they brought the book to life. The most incredible thing? The life-like feel of the movie. 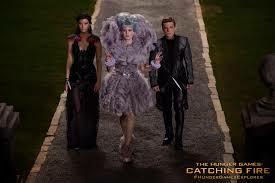 The fact that you can see Effie’s make-up the way it would look up close if you were standing there. People generally looking like they would if you saw them on the street. The slow turn of the tides, caused by Katniss being Katniss. I wish I could say more on that subject but it would spoil the future films for the people who haven’t read the books. If you have a chance, do read them. The background will be better explained and the politics around the story will start to take shape. And speaking of politics, Donald Sutherland made sure President Snow is portrayed in perfect unison with the book. Masterful! Just watching the two of them acting and interacting (Donald and Jennifer) makes it a worthwhile trip to the cinema. P.S. Honorable mentions for being great in bringing characters to life go to: Woody Harrelson for Haymitch, Elizabeth Banks for Effie, Jena Malone for Johanna, Sam Claflin for Finnick and of course, Josh Hutcherson for Peeta. Hey Ines: I haven’t seen this one yet (I did really enjoy the first film), and haven’t read the books. I will put the books on my ‘to read’ list – thanks! And then let me know what you thought of them. I will! I saw Jennifer Lawrence on David Letterman the other night – she’s absolutely adorable. She is! I love how normal in all that Hollywood glitter she is. I plan on watching it again soon. Truly, the whole movie has some great acting. But the scene that made me realize how great Jennifer is in acting is the last scene of the movie. I’ve read the books and I know what was going through her mind but even if I haven’t, it was obvious on her face. I have not read these yet, but I plan to. Good to know that the movies are good as well.